Any charged particle moving through a magnetic field will experience a force that will cause it to move in a particular direction. 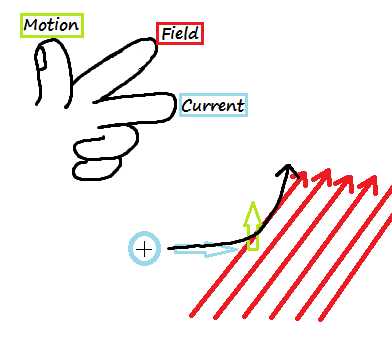 An easy way to remember the direction of this force is Fleming’s Left Hand Rule (where the direction of current is the direction in which positive charges move). So for the example above, a positive particle moving into a uniform magnetic field experiences a force that pushes it up away from the magnetic field. This “motion” of the charged particle is due to the magnetic field that the moving charge makes, interacting with the magnetic field it is moving through (just like two magnets can repel each other). We can use this rule to figure out the direction in which the rotating arm of a motor will move. This effect is used to define the standard international (S.I.) unit of magnetic field – the Tesla. 1 Tesla = the value of magnetic field (B) that causes a force of 1 Newton to act on a 1 meter length of conductor (i.e. copper) carrying a current of 1 Ampere at right angles to the magnetic field. This entry was posted in Magnetism and tagged electric current, electricity, fleming, magnet, motor, Physics on August 4, 2014 by kmorrison2013.